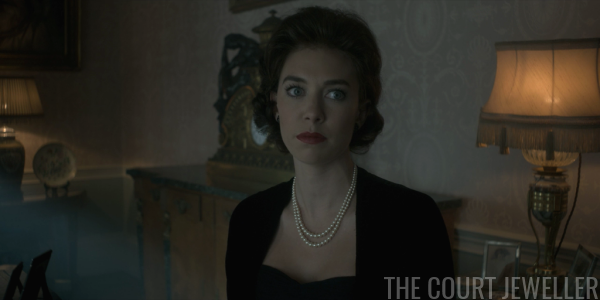 It's Monday morning, which means it's time for another installment of our recaps of The Crown! 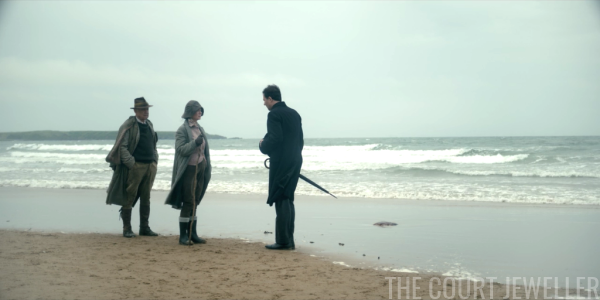 Today, we're talking about the eighth episode of season one, "Pride and Joy" -- an episode that plays fast and loose with historical timelines. 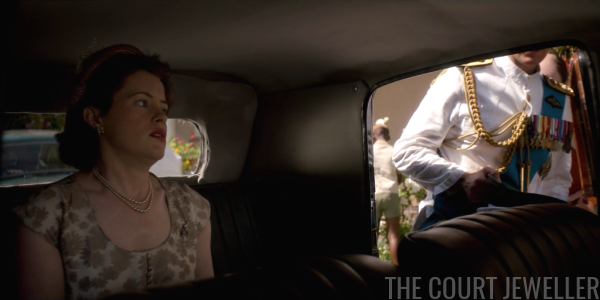 If you need to catch up on any of our previous recaps before reading, head over here! 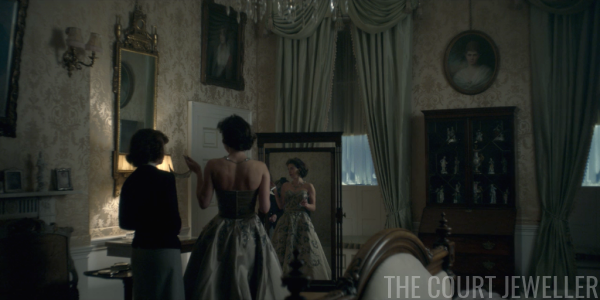 We open the episode with a jewelry moment we've seen over and over again this season: a royal woman sitting while her dresser puts on her pearls. This time it's the Queen Mother, and she's clearly upset as her royal pearl uniform is fastened in place. 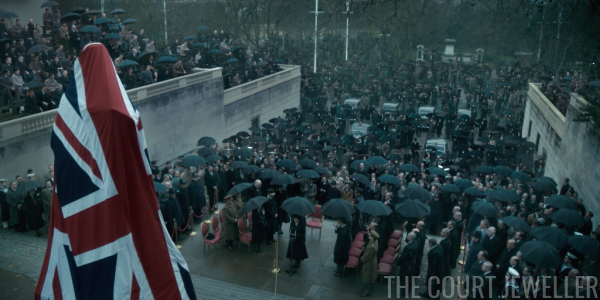 She calls her daughters in for a meeting, and the reason for her distress becomes clear: she was supposed to speak at the unveiling of the new memorial to George VI on the Mall, but she doesn't feel she's able to do it. 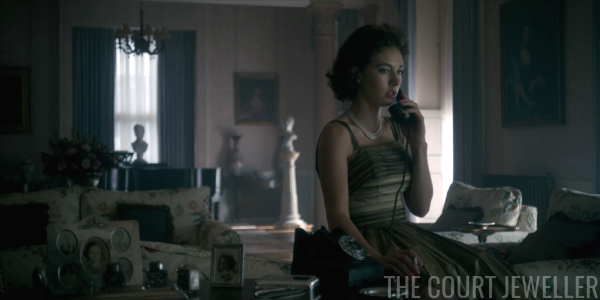 Princess Margaret, who wears pearls with dark earrings, immediately volunteers. Why? She likes making speeches, and after all, she was Bertie's favorite. Everyone gathers at the new memorial for the unveiling of the statue. In real life, this event took place in October 1955. (None of the events shown in the episode fit together in terms of a real timeline, so don't bother trying too hard to reconcile them.) Here's newsreel footage from the actual unveiling. The Queen wore the Williamson Brooch at this event in real life; here, she's in another of the "inspired by" pieces (the one I call the "ribbon brooch" in my notes). 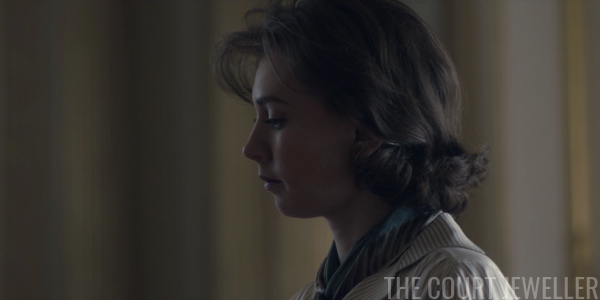 Princess Margaret looks bereft in her pearls and dark earrings. 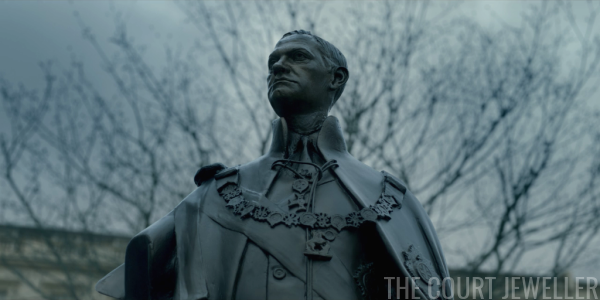 The Queen unveils the statue which -- bless the poor thing -- looks more like Martin Freeman from Sherlock than either Jared Harris or King George VI. 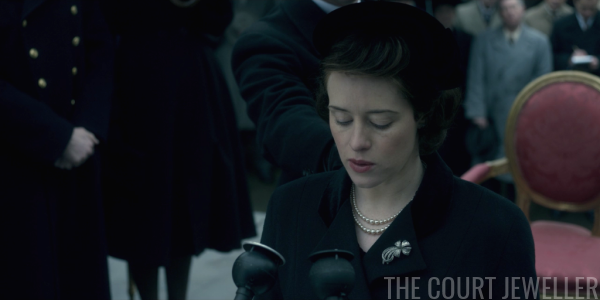 The Queen Mum wears pearl earrings, a single-stranded pearl necklace, and a dark mourning brooch. She gets teary-eyed as the statue is unveiled, and then she abruptly departs in a waiting car. 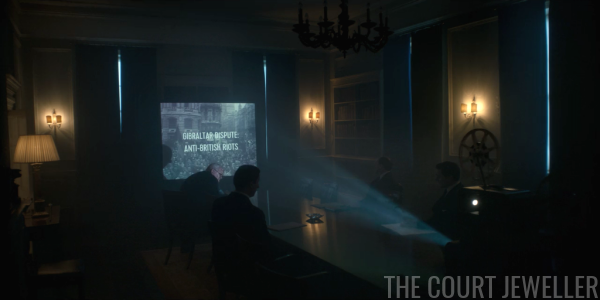 We cut to Churchill in a meeting, watching footage of anti-British protests in Gibraltar. They're in the middle of planning for the Commonwealth Tour, which began in November 1953 and lasted until April 1954. (Told you the timeline is seriously off in this episode!) There's a lot of disagreement about whether the Queen should go to Gibraltar at all. Michael Adeane thinks not; Churchill, being Churchill, thinks they shouldn't back down. Elizabeth is in the midst of another part of the tour planning: she's at Norman Hartnell's studio to discuss the wardrobe. 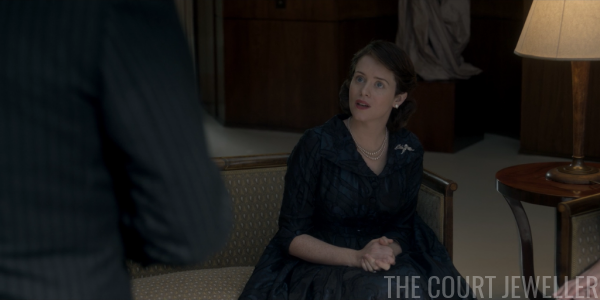 She wears the "bird" brooch as she expresses astonishment that they couldn't be a bit more economical in the number of pieces they're taking along. But Hartnell says that he has orders straight from the government to make sure they keep up appearances. 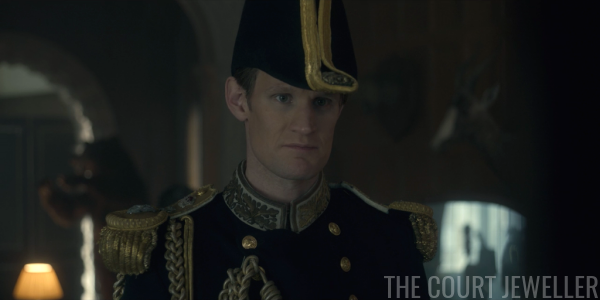 Also in wardrobe mode: Philip, who is having fittings for new dress uniforms. He's typically grumpy about the whole thing, dismisses the uniforms as "costumes," and calls the upcoming tour the "Commonwealth roadshow." Even after the televised coronation, he apparently still hasn't figured out how much monarchy relies on theatrics. 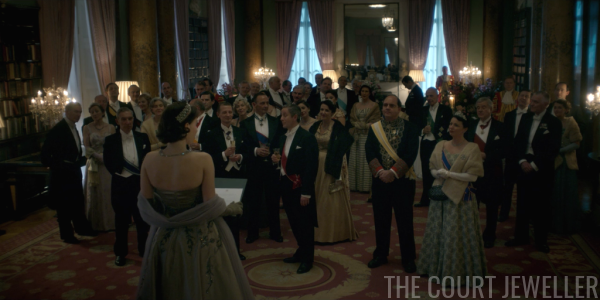 But in this fictional universe, the Queen Mother packs up, even before the Queen embarks on the tour, and heads to Scotland. 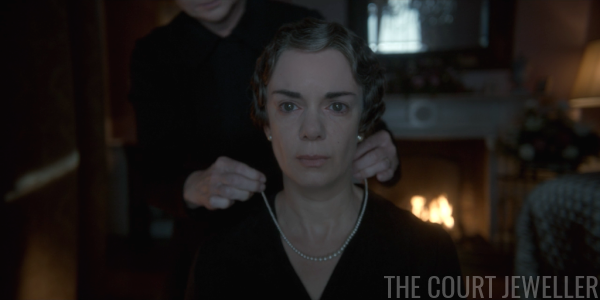 Wearing her pearls, she encourages Elizabeth to let her sister shine in her absence. 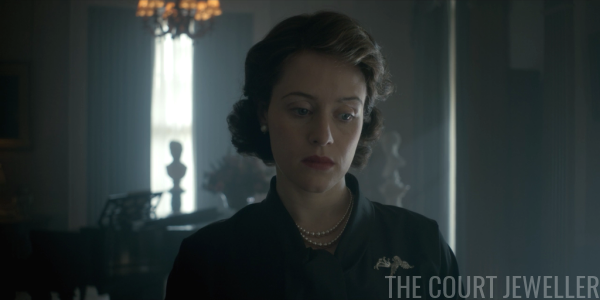 Elizabeth is in her jewelry uniform: pearls and the "ribbon" brooch. 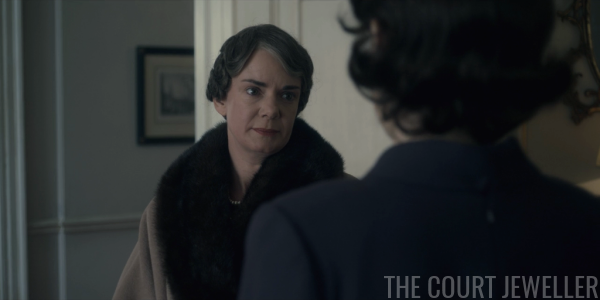 You'll remember that the last major encounter we saw between Elizabeth and Margaret ended with a threat over the telephone, so her reluctance should not be surprising. Meanwhile, Margaret is already getting ready for investitures. She makes Elizabeth help her practice her knighting skills. 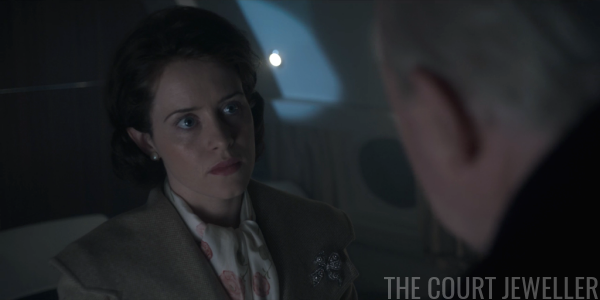 Elizabeth's wearing the "inspired by" bow brooch as Churchill boards the plane to bid her farewell -- and to remind her, for the umpteenth time, that people want to see the Queen, not Elizabeth Windsor. "Let them see only the eternal," he says Churchill-ly. 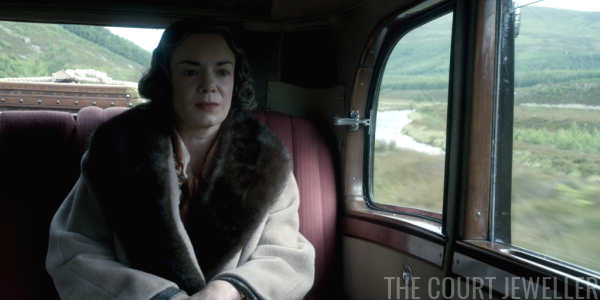 The other Queen Elizabeth -- the Queen Mum -- has thrown off the shackles of monarchy and escaped to Scotland, where she'll be staying with her friends, Clare and Doris Vyner. (The slight hairstyle change makes her look about 20 years younger here.) 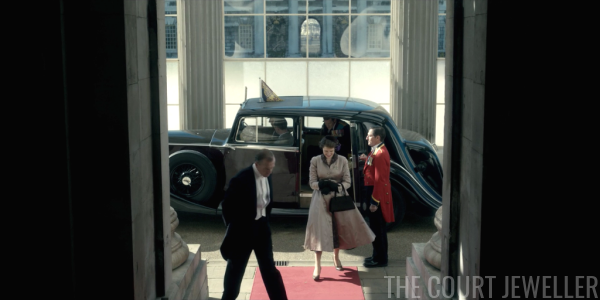 The visit depicted here actually happened in June 1952, a full year before the coronation. 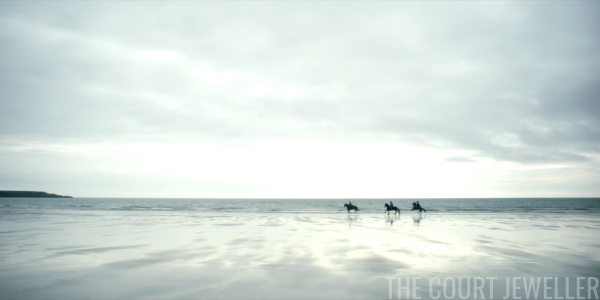 The Vyners understand that the Queen Mum is grieving and needs an escape, and they provide one in the form of extremely picturesque seaside horseback riding. 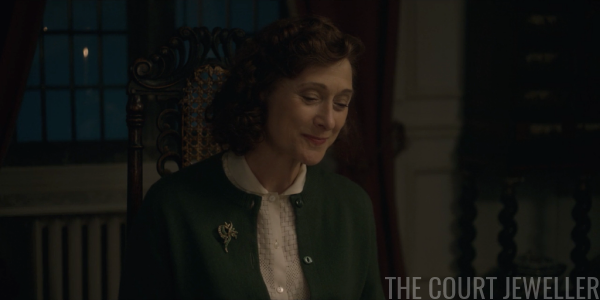 Doris Vyner (played by Caroline Goodall, who appeared in The Princess Diaries and The White Queen) sympathizes, wears an era-appropriate brooch, and mentions that the castle next door is for sale. The Commonwealth Tour officially kicks off in Bermuda. 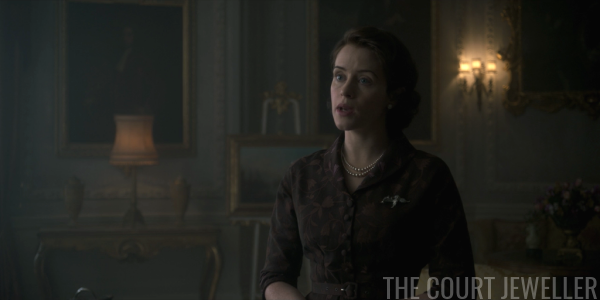 The younger Elizabeth wears a pearl necklace and floral earrings to make a speech. We see Bobo McDonald fiddling with the necklace once more as Elizabeth rushes to change into her next outfit, like an actress backstage at a play. Everything is timed carefully to the minute, which, as you can expect, is irritating Philip mightily. 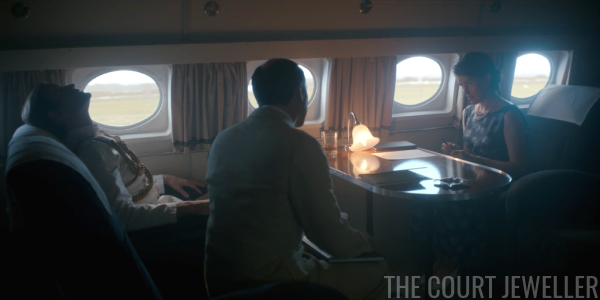 Philip is exhausted and Elizabeth is wearing pearls as they fly to their second stop, Jamaica. 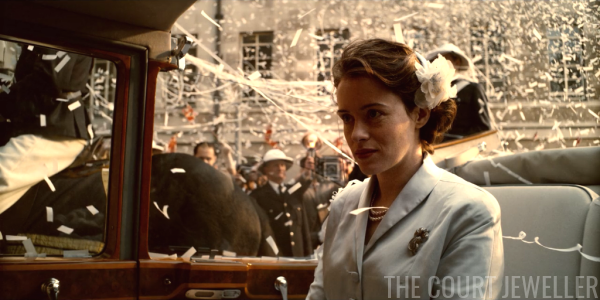 Margaret watches newsreel footage from the tour on television as a footman drops off a speech she's scheduled to give at a diplomatic reception. 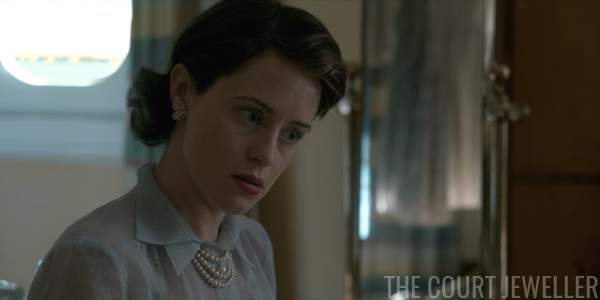 We get a glimpse here of early '50s gold earrings. 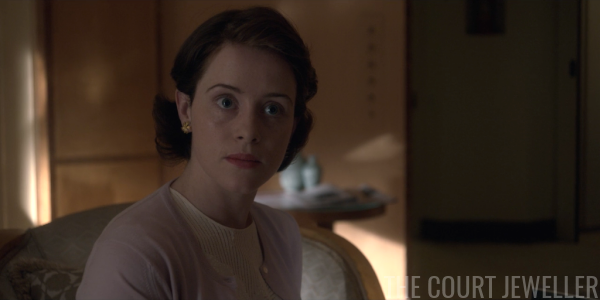 But Margaret's unhappy -- the speech sounds too dry, way too much like the Queen, and not enough like Margaret. 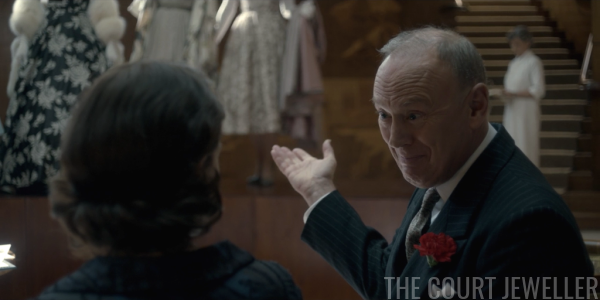 She wears her version of the pearly queen uniform to propose changes to Martin Charteris, who carefully explains that the text has been carefully crafted and shouldn't be altered. 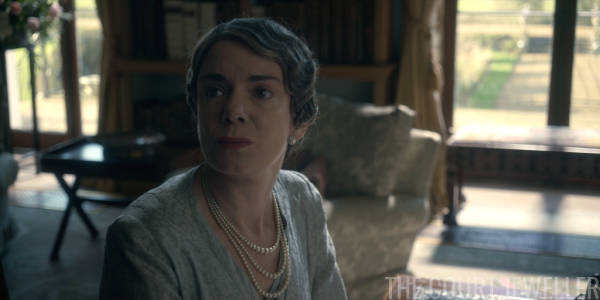 Margaret's fairly drunk on power, though, and the speech isn't the only thing she's dissatisfied with. 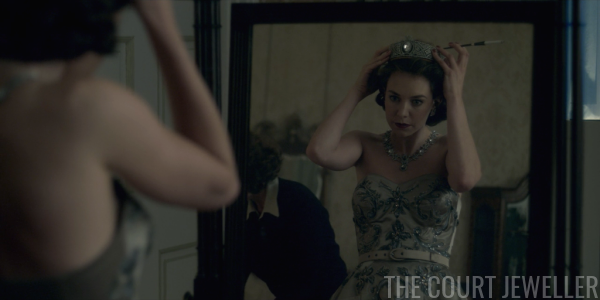 She starts off wearing the tiara from the coronation -- the one that isn't the Cartier Halo -- but takes it off, asking if she can wear a different one instead. More specifically, she wants one of her sister's. This scene was just so bothersome. 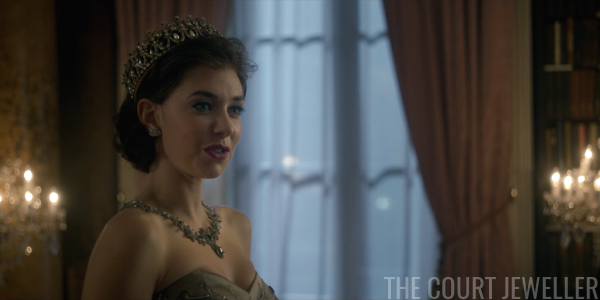 First, Margaret asks if she can wear "the State Diadem Tiara" -- meaning, presumably, the George IV Diamond Diadem. (You can't call something a "diadem tiara." It's redundant. It's like rectangles and squares: all tiaras are diadems, but not all diadems are tiaras.) 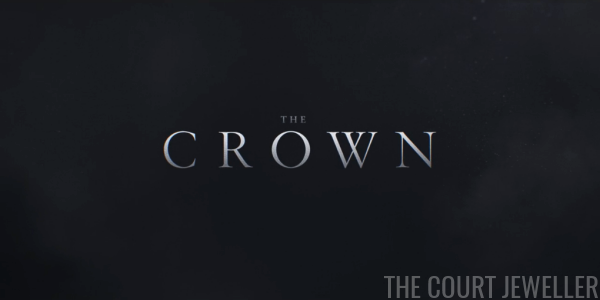 Only queens consort and regnant wear the diadem; it's one of the heirlooms of the crown. I don't think Margaret would ever have dared, even the weird, angry Margaret we see depicted here. 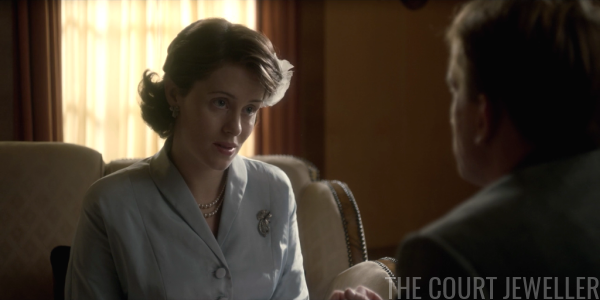 Second, she proposes the "Cambridge Lover's Knot Tiara." 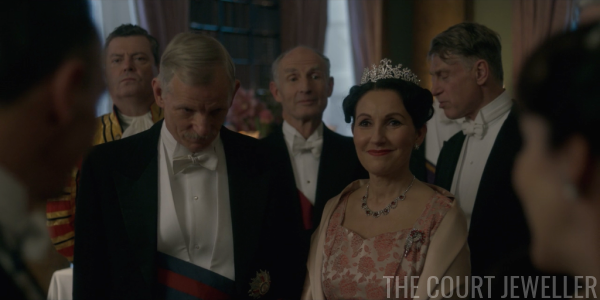 I'll forgive the production that mistake, because so many people still refer to Queen Mary's Lover's Knot Tiara by that name. That tiara, at least, is the Queen's personal property. 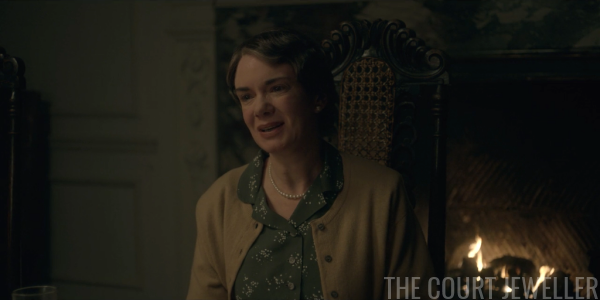 The dresser tells Margaret that she can't wear either, but Margaret insists that the Queen won't mind. 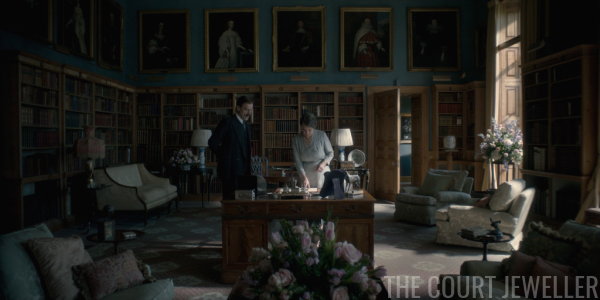 I'm not sure it really is, but that portrait above the curio cabinet sure looks like Young Queen Mary, glaring angrily down at this discussion of royal jewelry. Someone really needs to mail Peter Morgan a copy of Hugh Roberts's book on the Queen's diamonds, if nothing else. Yep, it's the production's version of the Lover's Knot Tiara. (I don't recognize the necklace or earrings here as deliberate royal replicas. If anyone else does, let me know in the comments!) I don't think Margaret ever wore this one publicly, but that's sort of the point here: she's not supposed to be wearing it, and she knows it. The other thing she's not supposed to do? Change the speech. But she does, adding a bunch of cringe-worthy, flowery prose at the beginning, and then putting in a bunch of rather pointed jokes. Here's the ambassador of Greece and his tiara-clad wife; Margaret jokes that the Greeks' contributions to society include her brother-in-law. Martin sees this diplomatic stand-up trainwreck happening and is powerless to stop it. Poor Martin. 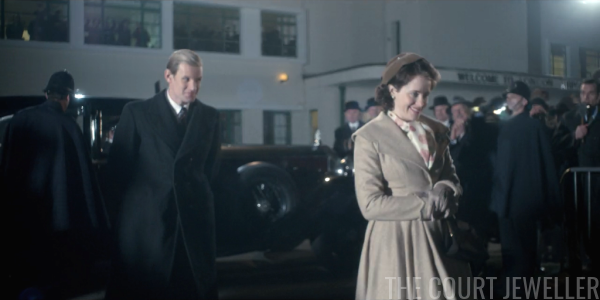 Margaret's lucky she only has to deal with Charteris in this case. Tommy Lascelles would definitely have tossed her in the Tower. 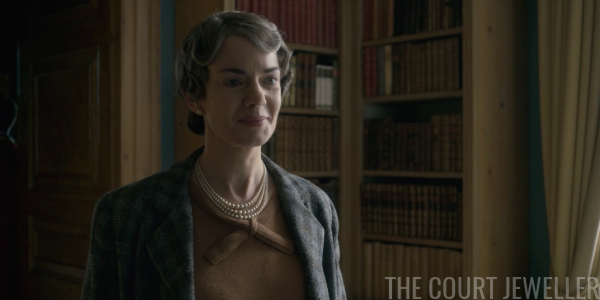 Margaret, though, is very happy with her performance, and we get a good look at her necklace as she calls Peter to tell him all about it. The British papers are pleased with Margaret's entertaining speech, too. 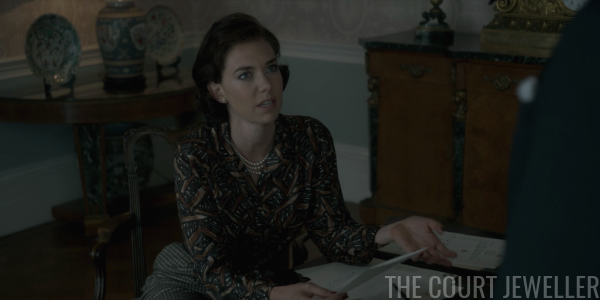 Elizabeth reads all about it while she's nearly strangled, once again, as her pearls are put in place. She also clips on her floral earrings. 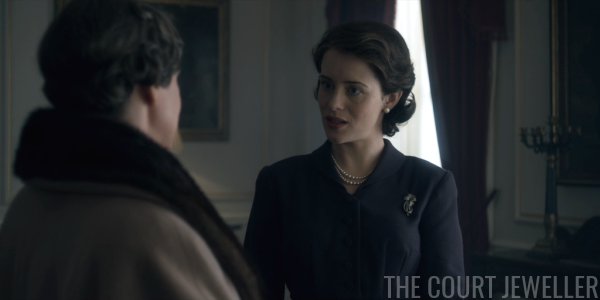 Philip accuses her of being jealous of Margaret, and he assures her that they can always count on Margaret to screw things up eventually. This does not make Elizabeth feel better. She's just exhausted. They're in Australia now, which means that time-wise, this is late December 1953 or early January 1954. As the car drives past crowds, she struggles to keep smiling, even while wearing her "ribbon" brooch. In fact, she smiles so much that she develops a muscle spasm in her face! Rather than slow down, she chooses to have an injection to relax her muscles. 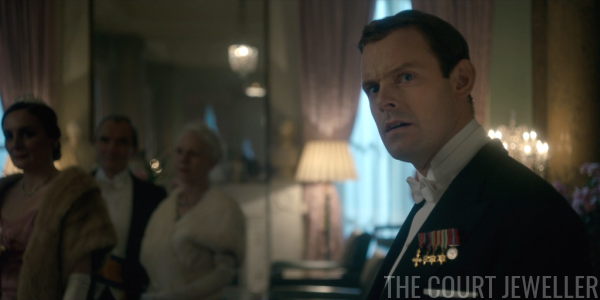 Philip is just incredulous that Elizabeth won't cancel any events or slow down at all. Meanwhile, in Scotland, the Queen Mother tours the castle next door to the Vyners' house. She's delighted when the eccentric owner doesn't recognize her; he thinks she's a famous actress. (Again, monarch/theater/acting/etc.) The castle is pretty much falling down and doesn't even have electricity. She loves it. Peter has a right to be worried. 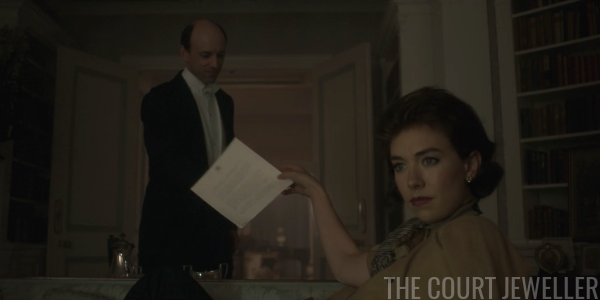 Churchill, frustrated with Margaret's unwillingness to stick to the script, comes over and essentially fires her. He's going to call the Queen Mum back from Scotland. 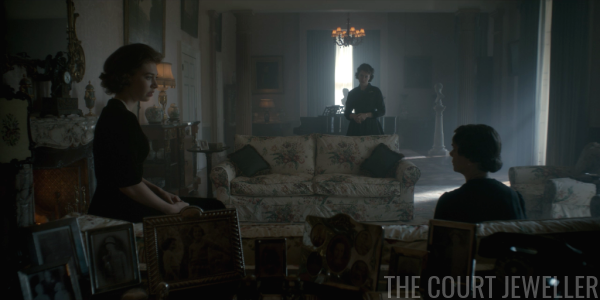 They have a conversation that largely rehashes the discussion between the Queen and Tommy Lascelles from the last episode about individuality and the monarchy. 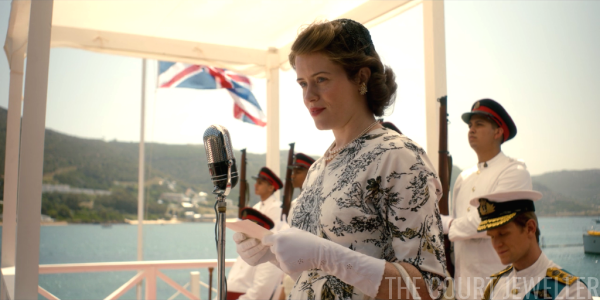 In Australia, Elizabeth and Philip come very close to disrupting the carefully-planned narrative themselves. 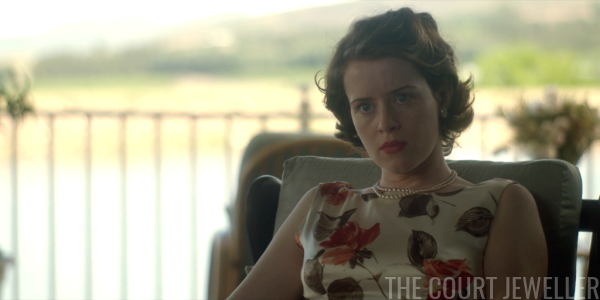 She wears her pearls as they argue, tired and frustrated with the never-ending tour. 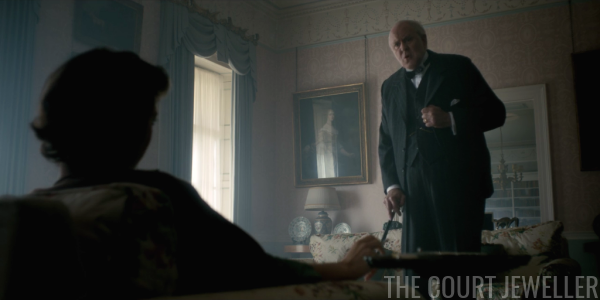 Philip threatens to have a cigarette, and then he accuses Elizabeth of trying to gain her dead father's favor by going through the grueling tour. 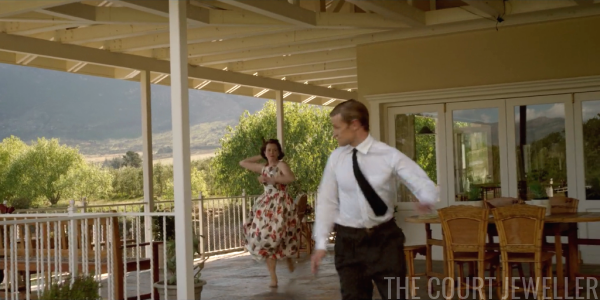 Elizabeth explodes at him, throwing glasses and tennis rackets. Philip runs away from her -- right into the range of the cameras sitting outside. 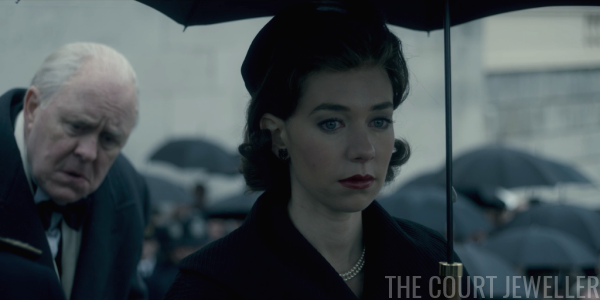 Elizabeth has to go out and speak with the cameramen, who decide to give her the newsreel footage, saving her from wider public embarrassment. 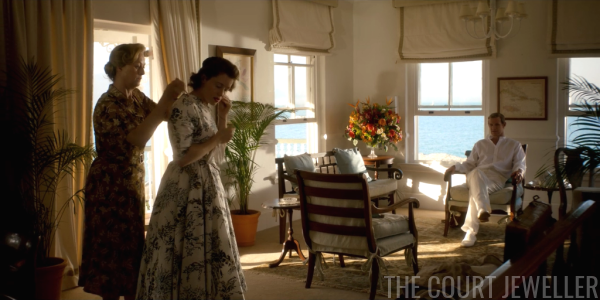 She and Captain Imbert-Terry, the castle's owner, are walking back to the Vyners' house when someone from the PM's office tracks her down and explains that she needs to head back to London immediately. We skip to April 1954, when the Commonwealth Tour entourage was heading to Malta. 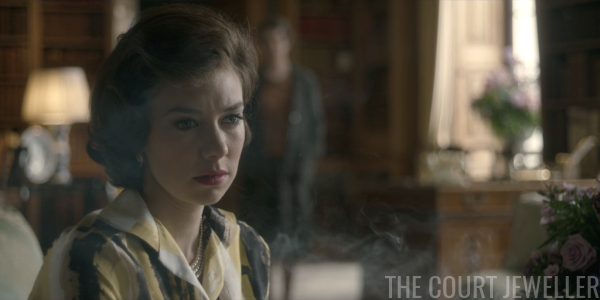 Elizabeth wears gold earrings as she and Philip disagree about whether they should go to Malta. She insists that they'll go. Refreshed and pleased with her real-estate purchase, the Queen Mother arrives back at Clarence House, pearls firmly in place. She's just in time to watch Margaret watch the Queen's arrival in Gibraltar through a haze of cigarette smoke. And then, we jump forward in time yet again, to May 1954. 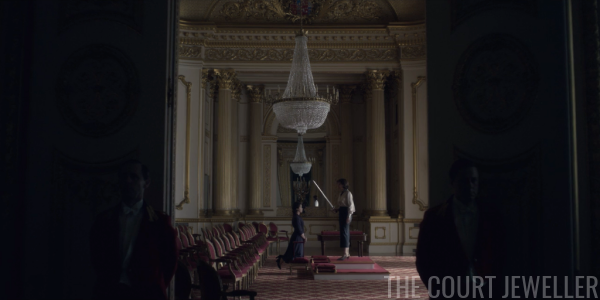 Elizabeth and Philip are back at the palace, where they're reunited with Charles and Anne. (In real life, the kids met them in Malta.) I'm disappointed with the quick, glossed-over way this lengthy tour was handled. If the fog got its own focused episode, surely the tour could have, too? 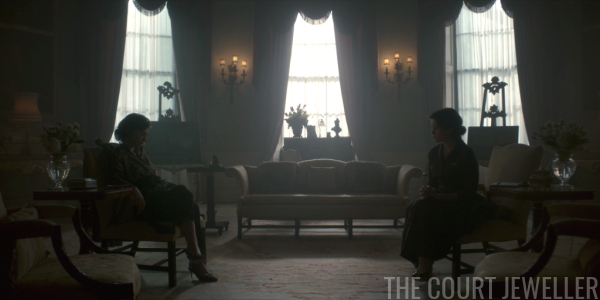 After a brief meeting with Churchill, Elizabeth summons Margaret. 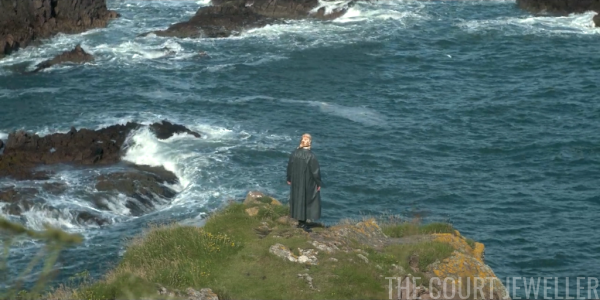 It's a scene very reminiscent of the scoldings we saw at the end of episode seven. 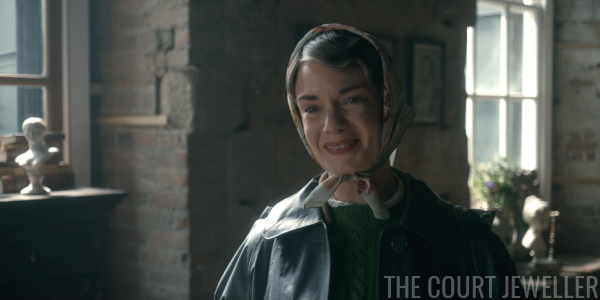 Margaret comes in wearing her version of the pearly queen uniform yet again, but the conversation reveals that Margaret has fundamental misunderstandings about the role of the monarch. 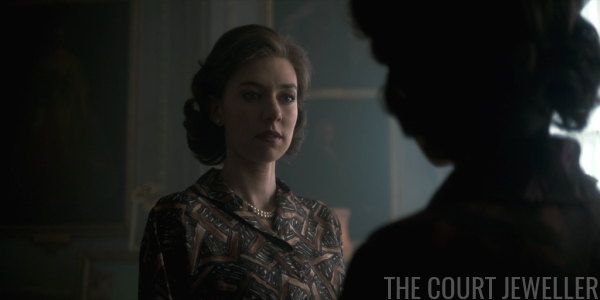 Building on conversations had throughout the season, Elizabeth explains that the monarchy should shine, not the monarch. 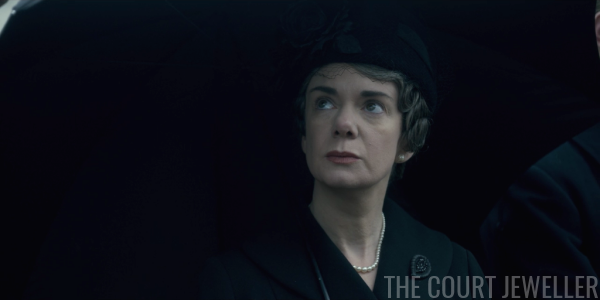 They have a back-and-forth about who has the worst life -- it's all very "grass is greener," with Margaret wishing she had clearer rules and Elizabeth wanting more freedom. 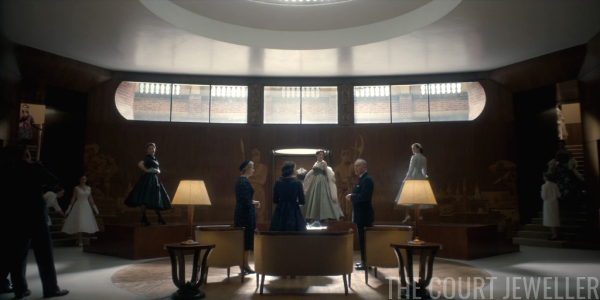 They also squabble a bit about who was George VI's favorite, and they remember that he called Elizabeth his "pride" and Margaret his "joy." In the end, they walk away without resolving much of their tension. But you know who doesn't give a hoot about any of it? The Queen Mother! She apparently headed straight back to Scotland. Forget the palace. She's got a castle of her own now.